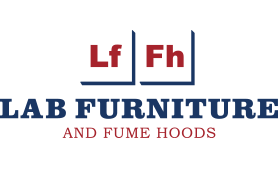 Laboratory Furniture Manufacturer - Full-Service Lab Design & Installation | LFFH, Inc.
Offering a comprehensive line of high quality, laboratory furniture and fixtures: modular steel furniture, stainless steel cabinets, wood casework, countertops, sinks, and safety equipment. Furnishing a wide range of applications from health, to education, to R&D: The Green Solution Hood, high performance models, space saving thin wall units and airfoil bypass hoods. Lab Furniture and Fume Hoods knows that every lab design is unique. We will design, create and build the perfect space starting with our free lab design services. Lab Furniture and Fume Hoods is your comprehensive resource for all things laboratory design and furnishings. Our Award Winning Laboratory Design Professionals provide full-service laboratory design, drawings, revisions, budgeting, and sales, plus full-service project management. Our products are manufactured in the United States (96%) and are protected by a 5 Year Manufacturer’s Warranty – often copied, never duplicated. Our product offerings are broad and deep including chemical fume hoods, laboratory countertops, flexible lab furniture, and lab accessories and safety equipment. And product customization is “standard” with each project. In addition to our laboratory furniture products we have been recognized as Laboratory of the Year by R&D Magazine (2016 – University of Illinois) and most recently by the City of New Berlin (2017) for our tremendous growth and outstanding service to the local community and global clients. Attractive, durable, functional and adaptable. A comprehensive line of steel laboratory furniture to suit every type of lab, customized to your requirements and guaranteed for a lifetime. Rugged and naturally beautiful. Available in limitless combinations of species, styles and finishes wood casework and benches add warmth and refinement to your lab. Integrated systems built with quality and designed for longevity and adaptability. 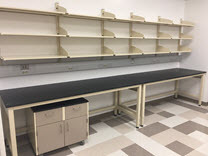 This laboratory furniture offers flexibility to evolve with the changing needs of your laboratory space. Lab Furniture and Fume Hoods Inc. is a full service firm that offers planning, design, sales, installation, project management, testing and certification for research, product development, materials analysis, science and education laboratories.